Following a standout two-year career at College of San Mateo, Half Moon Bay native Harlee Donovan continued her upward ascent at Southern Oregon University, where she earned the 2018 NAIA National Player of the Year award. Borg said Donovan got a firsthand look at 2017 NAIA Player of the Year Kali Pugh — who happened to be on the Palomar College team that beat Donovan and the CSM Bulldogs in the 2015 California Community College Athletic Association final four. “For Harlee, it was very enlightening for her to see someone at her level excel at a school,” Borg said. “I think I can be that person.’ I remember her saying that to me last year. While Donovan and her Southern Oregon teammates were returning to the West Coast following the Raiders’ heartbreaking loss in the NAIA World Series, it was announced that Donovan was named the NAIA National Player of the Year. Ever since her senior year of high school at Half Moon Bay, Donovan has simply gotten better and better. This year, her senior season, Donovan batted .447 with 80 hits, 49 runs scored, 31 extra-base hits with 12 home runs, 77 RBIs and an on-base-plus-slugging percentage of an eye-popping 1.364. 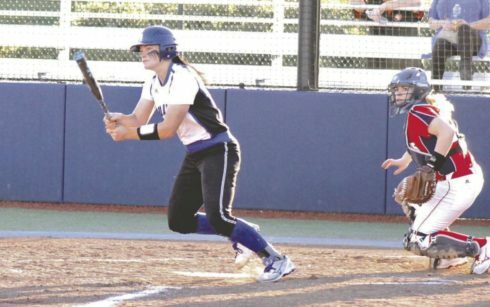 Over her two-year career with Southern Oregon, which is located in Ashland, Oregon, Donovan averaged a .372 batting average, with 11.5 home runs and 70 RBIs, and an OPS of 1.209. This on the heels of a stellar career at CSM, where she set the all-time career home run mark of 38 and captured the California Community College Fastpitch Coaches Association Northern California Player of the Year award following her sophomore season in 2016. “She’s probably going to hold that home run record at CSM for a long time,” Borg said. In her two years with the Bulldogs, Donovan batted .487, with 140 RBIs, the aforementioned 38 homers and an OPS of 1.114. This on the heels of being named the Peninsula Athletic League’s Bay Division Player of the Year her senior year with Half Moon Bay. The only thing missing in an otherwise standout college career was a state or national title. She and CSM got to the state final four in both her years, but the Bulldogs failed to close the deal. At Southern Oregon, she went to back-to-back NAIA World Series — falling in the loser’s bracket final her junior year and, this season, the loser’s bracket semifinals. And to think there was a time when Donovan seriously considered giving up the sport after graduating Half Moon Bay. The Donovan family has lived on the coast for generations and she is very tight with her family. It took some convincing from Borg for Donovan to play at CSM. Once Donovan decided to play, she threw everything she had into the sport. When Borg was asked if Donovan’s talent could have translated to the NCAA Division I level, Borg said there was more to Donovan’s decision than meets the eye. “She could have played at whatever level she wanted,” Borg said. “It was a better fit for her to go where she was going. She knew what her strengths and weaknesses were. She wanted to go into a program where she could really excel. She made a great choice (in choosing Southern Oregon). This entry was posted on Monday, June 4th, 2018 and is filed under Alumni, Athletics, Headline, Softball. You can follow any responses to this entry through RSS 2.0. You can leave a response, or trackback from your own site.